The tiny Cavalier King Charles Spaniel puppy with the checkmark “swoosh” on her leg started life like any other puppy — blind, deaf, seeking the warmth and nourishment her mother offered. Like too many other puppies, though, she was born in a puppy mill and was chosen for the worst possible fate — rather than being sold to a puppy broker or a family, she was chosen to be a breeder. Gracie, as she eventually was named, spent about five years inside of a metal-grate cage, never feeling grass or even a regular floor. She was filthy, constantly hungry, and in pain from an eye problem that would plague her throughout her life. Author Carol Bradley, an award-winning journalist, weaves Gracie’s story into her thorough and informative tale of American puppy mills. Packed with information, Saving Gracie chronicles the 2006 raid on a large Pennsylvania puppy mill where Gracie was one of 337 dogs removed to new lives. Bradley describes other puppy mill raids, tells the stories of heroic individuals who made these raids possible, and describes the scope of the problem and some of the ways dog lovers in Pennsylvania and nationwide are fighting the large-scale breeders who commit almost unimaginable cruelty in their greedy exploitation of dogs and pet-loving Americans. Saving Gracie could be a difficult read; Bradley does not sugarcoat anything and the conditions that puppy mill dogs endure are as heart wrenching as they are stomach-turning. Yet, somehow, the book seems hopeful. Gracie finds a home with a loving and incredibly patient single mom, Linda. Once Gracie becomes indisputably Linda’s dog, the family adds two more retired breeding dogs. As awareness of puppy mills grows, the HSUS, ASPCA, and lawmakers in several states are beginning to take action. So much more is needed, but Bradley ends the book with a hopeful epilogue that lists some early successes. Through her telling of Gracie’s story, and glimpses into the lives of other puppy mill rescues, Bradley explains the problems of puppy mill dogs, which begin with health problems but include lack of socialization, mistrust of humans, difficulty housebreaking, and a slew of behavioral problems that stem from the neglect and abuse the dogs suffered. While young puppies that are removed from the puppy mill escape the worst conditions early in their lives, they, too, suffer from health problems due to the filthy environment and congenital defects due to irresponsible breeding, and they are often poorly socialized. Bradley does not paint all large-scale breeders as evil, carefully distinguishing between responsible breeders and puppy mills, and explaining the differences. She exposes other horrors, such as puppy auctions, that many readers might not know about. Without being pedantic or preachy, Bradley tells readers how to find puppies from responsible sources and what to look for in deciding where to purchase a dog. One by one, dog lovers can make a difference by refusing to buy puppy mill dogs and by supporting efforts to eradicate puppy mills. 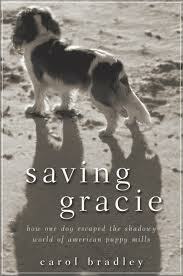 Saving Gracie is a heartwarming story of one dog’s rescue and a call to action for all readers.